The coconut definitive was a comeback for Sultan Sir Hisamuddin Alam Shah Al-Haj ibni Almarhum Sultan Alauddij Sulaiman Shah Al-Haj (1898–1960), who had been kicked out by the Japanese during the war for not supporting them. 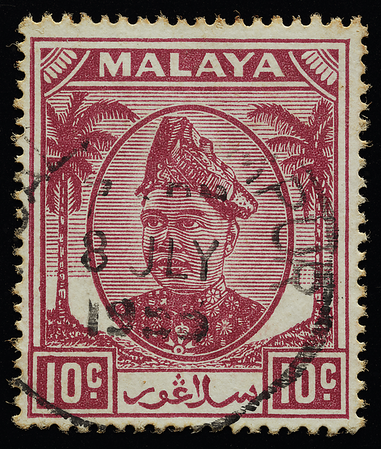 He was the first reigning Malayan sultan to make a pilgrimage to Mecca (Corfield & Corfield 2012). The portrait shows part of his neck badge of the Knight Commander of the Order of Saint Michael and Saint George awarded in 1938, the Imperial State Crown being discernible above the seven-armed Maltese asterisk. 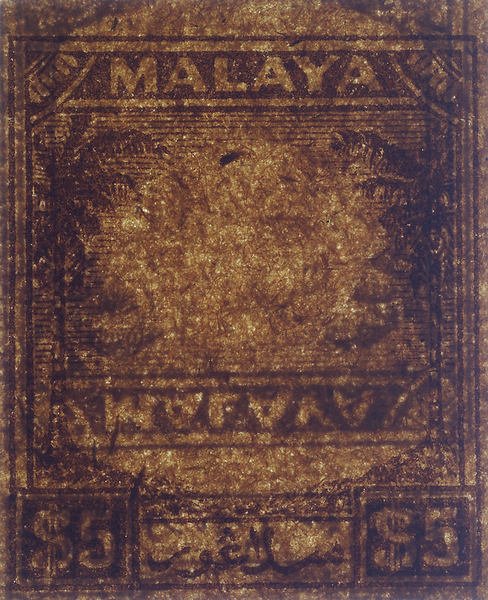 Transillumination of a rare double-sided plate proof of the $5 duty plate, formerly in the collection of the late Dr Abdul Majid Dato Kassim, who was noted for his documentation of the uncatalogued stamps of Malaya. 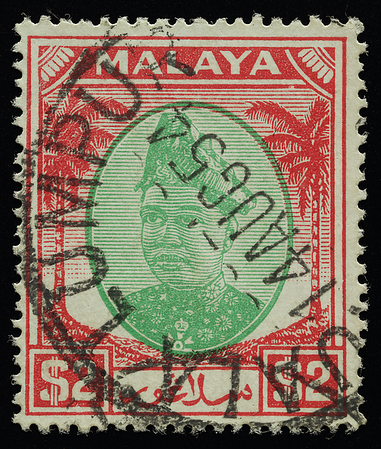 Selangor $5 plate proofs have also been reported by Parr (1972) and Holley (2010a). The fibre network is rough and uneven. Notice that one side of the paper is in focus while the other side is out of focus, creating a three-dimensional effect that evokes the vernacular art of shadow puppetry or wayang kulit. This was achieved with a flat-field lens with an extremely shallow depth of field.